Here is a paper about eigenstates, etc… Self-organization into quantized eigenstates of a classical wave driven particle (Stéphane Perrard1, Matthieu Labousse, Marc Miskin, Emmanuel Fort, and Yves Couder). Compare that with my hastily written post. “Couder could not believe what he was seeing”. Here it was sort of a eureka moment at home on a Sunday afternoon. Valentini (along with me) thinks that QM is wrong, in that its not the ‘final layer’. His de Broglie arguments are powerful and hit close to home for me. I have read most of David Bohm’s papers and books since discovering him as a 4th year undergrad back in the 80s. Bohm’s ideas launched mine. Note that much of physics is built on the assumption that with QM somehow ‘this time its different’ – that any future theory will need to be QM compliant or it is wrong. As if QM was somehow as certain as the (mathematical and hence solid) 2nd Law or something. This leaves no room for argument or dissent. Perfect conditions for a paradigm change! This is the presentation that outlines things as he sees them. I see things that way too, although I am of the opinion that the pilot waves are GR ripples. Not even wrong. Why does nobody like pilot-wave theory? One response to QM from waves – pilot waves. NEW model following the Bohm Interpretation. Model produces a path of photons similar to the Fig. 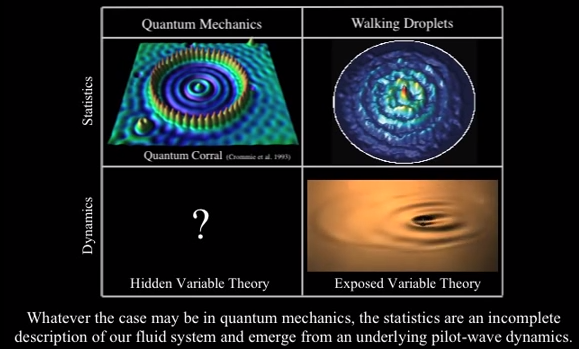 5cof J. W. Bush, “the new wave of pilot-wave theory”, Phys. Today, 68,8 2015. Model started to explain “coherence” with particles with the criteria that a Fraunhofer Pattern be on a screen when passed through a slit after traveling a long distance . When the path of the particles was followed, the pattern of Bush was seen. The real experiment was developed. It is a REAL experiment, easy to do, but yet rejects wave models and it was PREDICTED.Copenhagen is rejected by experiment. The STOE suggests the quantum world experiments can be accounted by the new assumptions of the hod and plenum. So, Newtonian scale models account for quantum scale and cosmology scale observations.